Develop a concurrent TCP server that generates random numbers using only about 65 lines of Go code. This article is part of a Go series by Mihalis Tsoukalos. Read part 1: Creating random, secure passwords in Go. TCP and UDP servers are everywhere serving network clients over TCP/IP networks. In this article, I will explain how to develop a concurrent TCP server, in the Go programming language, that returns random numbers. For each incoming connection from a TCP client, the TCP server will start a new goroutine to handle that request. You can find this project, concTCP.go, on GitHub. result := strconv.Itoa(random()) + "\n"
The net.Listen() call is used for telling a Go program to accept network connections and thus act as a server. The return value of net.Listen() is of the net.Conn type, which implements the io.Reader and io.Writer interfaces. The main() function also calls the rand.Seed() function in order to initialize the random number generator. Finally, the for loop allows the program to keep accepting new TCP clients using Accept() that will be handled by instances of the handleConnection() function, which are executed as goroutines. The first parameter of the net.Listen() function defines the type of network that will be used, while the second parameter defines the server address as well as the port number the server will listen to. Valid values for the first parameter are tcp, tcp4 (IPv4-only), tcp6 (IPv6-only), udp, udp4 (IPv4- only), udp6 (IPv6-only), ip, ip4 (IPv4-only), ip6 (IPv6-only), Unix (Unix sockets), Unixgram, and Unixpacket. The last line of the output of the preceding command informs us that there is a process that listens to port 8001, which means that you can still connect to TCP port 8001. The first two lines verify that there is an established TCP network connection that uses port numbers 8001 and 62556. Similarly, the third and fourth lines verify that there is another established TCP connection that uses port numbers 8001 and 62554. The concTCP.go TCP server in action. 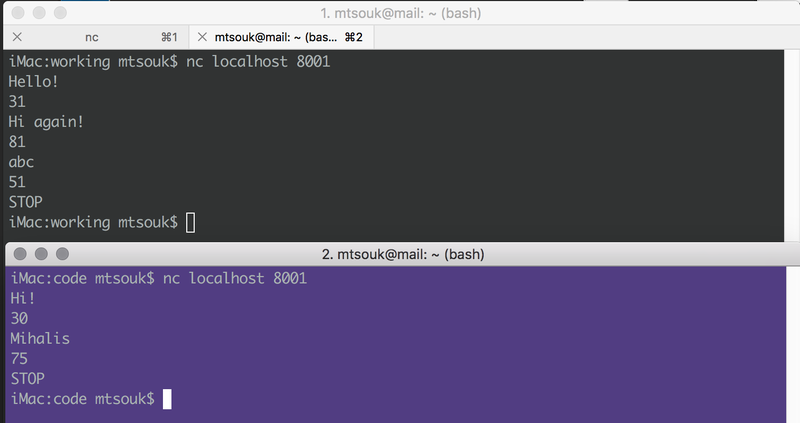 Using the nc(1) utility as the TCP client to concTCP.go. You can find more information about nc(1), which is also called netcat(1), on Wikipedia. So, you have just learned how to develop a concurrent TCP server that generates random numbers using about 65 lines of Go code, which is pretty impressive! If you want your TCP server to perform a different job, just change the implementation of the handleConnection() function.